PESHAWAR, Pakistan -- A suicide bomber blew himself up outside a government office in a northwestern Pakistani city on Tuesday, killing at least 22 people and wounding 45. A breakaway Taliban group quickly claimed responsibility for the attack. 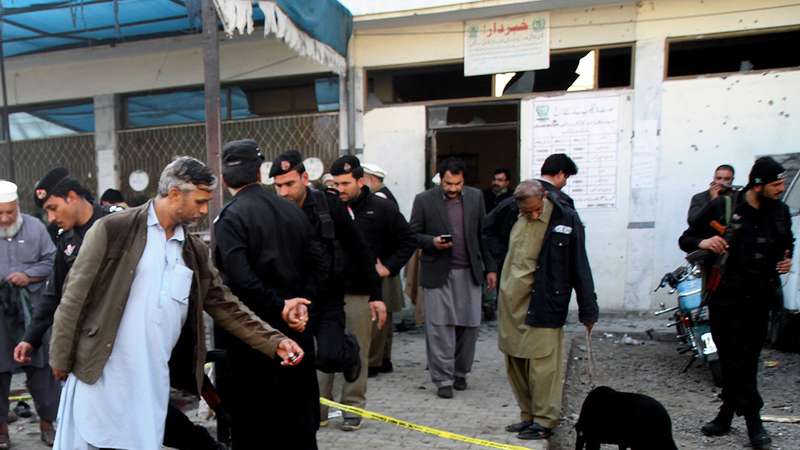 The bombing took place in the city of Mardan, outside the regional office of the National Database and Registration Authority, or NADRA, which issues identity cards to Pakistanis, according to senior police officer Saeed Khan Wazir. Wazir told The Associated Press that some of the wounded were in a critical condition. Shortly after the attack, a spokesman for the militant Jamaat-ul-Ahrar group, Ahsanullah Ahsan, claimed responsibility for the bombing, calling it a "noble act to punish NADRA because it extends support to security forces." Ahsan spoke to the AP by phone from an undisclosed location. Jamaat-ul-Ahrar split from the main Pakistani Taliban group - the Tehrik-e-Taliban Pakistan or TTP - two years ago following differences between the militant leadership. Prime Minister Nawaz Sharif condemned the bombing and instructed authorities to provide the best possible treatment for the wounded. Mardan is about 50 kilometers (30 miles) northwest of Peshawar, the capital of Khyber Pakhtunkhwa province bordering Afghanistan and adjacent to the North Waziristan tribal region. Pakistani forces have been carrying out a major operation against the Taliban and other militant groups in North Waziristan since 2014. The military says it has almost eliminated militants in the operation. Earlier this month, the military claimed "phenomenal successes" in the war and said it has killed around 3,500 insurgents since launching the North Waziristan operation. The army says militants are on the run and security forces have broken their backbone. But attacks have also been rampant in Khyber Pakhtunkhwa province and in December 2014, militants strapped with explosives broke into a military-run school in Peshawar, the provincial capital, and killed 148 people - most of them children. The Taliban later claimed responsibility for the Peshawar school attack.